Wunderschön eingerichtete Casita. Ein Schlafzimmer, ein Bad mit einem neuen Schlafsofa. 588 Quadratfuß. Erwachsene Gemeinschaft, ein Gast muss 55 bleiben. Die Gemeinschaft bietet einen Pool und einen Whirlpool in kurzer Entfernung von Casita. Schöner Innenhof vor der Haustür. Zu Fuß zu Lebensmittelgeschäften, Restaurants und Einkaufsmöglichkeiten. Kommt mit Zugang zum Green Valley Recreation Center (gegen geringe Gebühr je nach Aufenthaltsdauer). Das Gerät verfügt über alle Annehmlichkeiten, Kabel und WLAN, eine schöne Küche, in der Sie Ihre eigenen Mahlzeiten zubereiten können. Sie können im nahe gelegenen Madera Canyon wandern oder auf einem der vielen Golfplätze Golf spielen. Machen Sie einen Ausflug nach Tombstone oder Kartchner Caverns. Great place , could get anywhere in town in about 5-10 min. or less. Very clean and comfortable. Hit a home run with me. We stayed here for a week and it was exactly as advertised. Convenient location in Green Valley. Casita was clean and neat, kitchen was equipped with everything you need, towels, sheets were all provided, as well as washer/dryer. Jamie was a great help, providing information about the shopping, restaurants, activities in the area. We really enjoyed our time there and would definitely like to return to this casita. Well organized 588 sq. ft. casita. Jamie provided everything needed for a pleasant stay plus some extra things such as fruit, bottled water, and toiletries. She takes excellent care of this casita. Thank you for your kind words. It was a pleasure having you stay. This casita was very nicely and thoughtfully appointed and worked perfectly for our short stay in Green Valley, AZ. 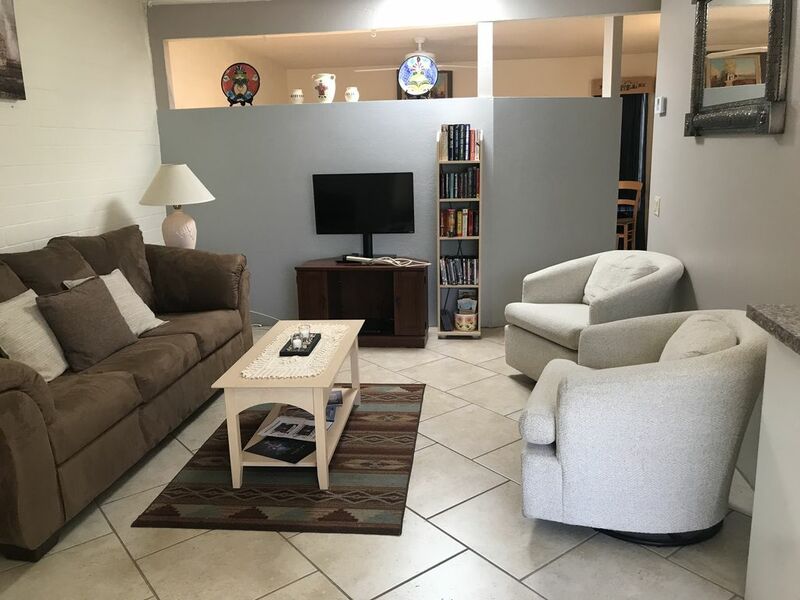 The unit was clean and well-maintained and located in a nice complex within walking distance to local businesses and a grocery store. The owner provided everything we needed in addition to thoughtful extras to make us feel like treasured guests. We appreciated and made use of the Guest Binder that provided us with information and suggestions for local activities and restaurants. If our travels ever take us back to Green Valley I would not hesitate to stay at this casita again. Thank you for your lovely and kind words. I am glad you enjoyed your stay in Green Valley and in my vacation casita. Jamie is the best landlord anyone can have. We always felt taken care of. Jamie was always available when needed. We didn't want to leave, because it was comfortable, cozy and well equipped.